"I will remember Aunt Nat in my heart and prayers." Nathaline M. Ferlo, 89, passed away peacefully in Albany, NY, surrounded by her family, on October 22, 2018. She was born in Rome, NY, on December 30, 1928, daughter of Antonio and Maria Grasso. She married her high-school sweetheart, Albert Ferlo, on October 9, 1948, and they were devoted to each other for 66 years, until Al’s passing on January 1, 2015. A long-time resident of Rome, she was an employee of AmeriCU Credit Union for over 35 years. Nat was devoted to her family, and she and Al rarely missed an opportunity to travel to visit their children and grandchildren or to support them in their milestone events. Holidays would often find Al and Nat "holding court" at the head of their family, whether at the home of one of their children, or at their home at 411 Healy Ave.
She is survived by her children, Jennifer (Vince) DeVivo, of Fayetteville, NY; Roger (Anne Harlan) Ferlo, of Chicago, IL; Albert Ferlo, of Washington, DC; Joseph (Carol) Ferlo, of Oshkosh, WI; and Patrick (Colleen) Ferlo, of Ballston Spa, NY; twelve grandchildren, and nine great-grandchildren. She was preceded in death by her parents, her husband, Al, as well as sisters, Lena, Pauline, America, and Virginia. A Mass of Christian Burial will be held on Friday, at10:30 AM at St. Peter's Church, with the Rev. Philip A. Hearn officiating. Burial will be in St. Peter's Cemetery. Family and friends may call on Thursday from 4 to 7 PM at the Barry Funeral Home, 807 W. Chestnut Street. In lieu of flowers, contributions may be made in Nat's memory to Marjorie Doyle Rockwell Center, 421 Columbia Street, Cohoes, NY 12047. Please offer online condolences at: BarryFuneralHome.com. 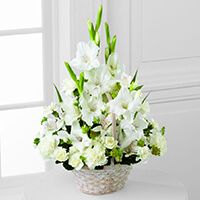 To send flowers to the family of Nathaline M. Ferlo (Grasso), please visit our Heartfelt Sympathies Store. We encourage you to share any memorable photos or stories about Nathaline. All tributes placed on and purchased through this memorial website will remain on in perpetuity for future generations. Roger, I am so sorry to hear of your mother’s passing. Be assured that you and your family are in my prayers. Natalie, we are sorry to learn of your grandmother's passing. I remember how fondly you spoke of your grandparents when we were working together. Our condolences to you, Luis, the boys, your Mom and Dad and your extended family. Pat, Colleen, Heather & Melissa - We're very sorry to hear about Nat's passing. Hugs and prayers to you and all the Ferlo family. Joe and I only have good thoughts of Aunt Nat. She was always there for us as we grew up and supported us as we planned our life together. She will be missed. Very sorry to hear of Aunt Nathaline's passing. She was a wonderful woman. Great memories of her and Uncle Al. Your family is in my thoughts and prayers. In Loving Memory of Aunt Nat. So sorry to hear of Aunt Nat's passing. She is in heaven with her husband, parents and sisters. I only have fond memories of her. She will me missed by many and live on in all of our memories.